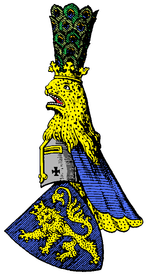 The House of Schwarzburg is one of the oldest noble families of Thuringia. Upon the death of Prince Friedrich Günther in 1971, the headship of the house passed under Semi-Salic primogeniture to his elder sister, Princess Marie Antoinette of Schwarzburg who married Friedrich Magnus V, Count of Solms-Wildenfels. The House of Schwarzburg subsequently became a personal union with the House of Solms-Wildenfels. 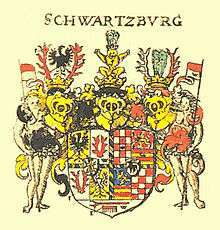 Reigning over the County of Schwarzburg and founded by Sizzo I of Schwarzburg (died 1160), the family split in the 16th century into the lines of Schwarzburg-Sondershausen and Schwarzburg-Rudolstadt, with the Sondershausen dying out in 1909. In 1197, Sizzo's grandson Heinrich II divided the common heritage with his brother Günther III and made Schwarzburg Castle his residence. 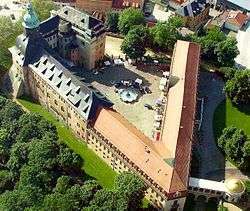 His territory then also comprised the nearby castle of Blankenburg. The most famous family member is Günther von Schwarzburg. In 1349, he was elected as German king by the majority of electors. But, due to less support, he renounced some month later and died shortly after. ↑ James, John Almanach de Gotha, Volume I, 2013.